322 pages | 49 B/W Illus. 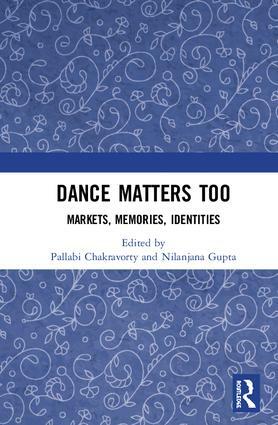 Dance Matters Too: Markets, Memories, Identities is a rich intellectual contribution to the growing field of dance studies in India. It forges new avenues of scholarly inquiry and critical engagement and opens the field in innovative ways. This volume builds on Dance Matters (2009), which mapped the interdisciplinary breadth of the field. The chapters presented here continue to underline the uniqueness of a field that is a blend of critical scholarship on aesthetics and performance with the humanities and social sciences. Including diverse material, analytical approaches and perspectives from scholars and practitioners, this multidimensional volume explores debates on dance preservation and tradition in globalizing India, multimedia choreographies and the circulation of dance via electronic media, embodiment and memory, power, democracy and bourgeoning markets, classification and censorship, and corporatization and Bollywood. This tour de force will appeal to those in dance and performance studies, cultural studies, sociology as well as to readers interested in tradition, modernity, gender and globalization. Pallabi Chakravorty is Associate Professor and Director of the Dance Program in the Department of Music and Dance at Swarthmore College, USA. Nilanjana Gupta is Professor of English at Jadavpur University, Kolkata, India.